Shad Thames refers to its iconic namesake street and the surrounding area in Bermondsey. You may be surprised to learn that the area has a fascinating history, the remnants of which you can still see today. The area takes its name from a corruption of 'St John at Thames', which refers to the former landowners of the spot, the Knights of St John. 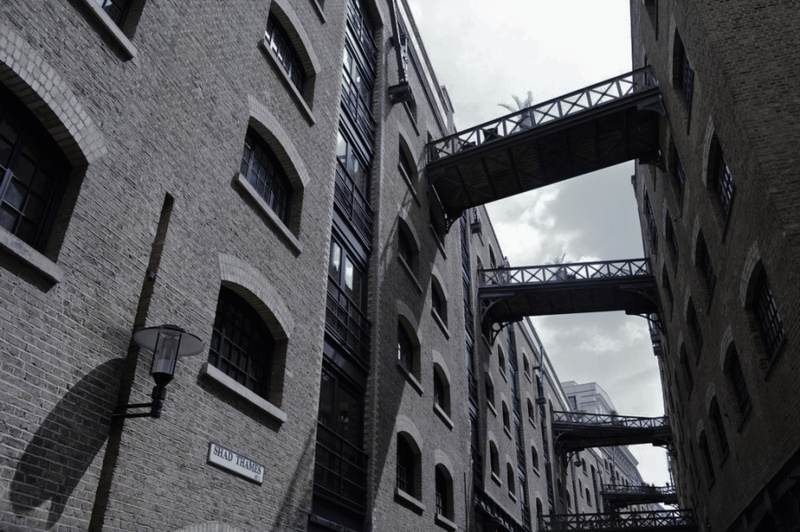 Shad Thames has a rich industrial history and has been home to some notable residents over the years. Its regeneration in the 1980s made it the place we know and love today. Let's look at the history of Shad Thames. During the Victorian era, Shad Thames was one of London's most important industrial hubs as it was home to the largest warehouse complex in London. The tea, coffee, dried fruit and spice warehouses of Butler's Wharf were completed in 1873. For this reason, the area became known as the 'larder of London'. You can still see the overhead gantries which connected the warehouses today, adding to the historic atmosphere of the area. During this period, Shad Thames' warehouses were forced to close as goods had to be unloaded further east due to congestion and containerization. The final warehouse closed its doors in 1972. Nevertheless, it was cheap to live in the area, making it popular with artists. Famous residents of Shad Thames in the 70s were artists David Hockney and Derek Jarman. The area was redeveloped in the mid-80s and 90s. The disused warehouses alongside the river were converted into flats, offices, shops, cafes bars and restaurants. In fact, some of the best-known restaurants such as Butler's Wharf Chop House and Le Pont de la Tour were opened by designer/restaurateur Terence Conran during the period of regeneration. The area is popular with residents and visitors alike thanks to its many landmarks and attractions. Tower Bridge, the Tower of London, The Shard and Potters Fields Park are all located nearby. Developments continue, and new buildings have popped up in recent years. The area is changing and attracting a variety of residents who want to call Shad Thames home. One local resident told The Telegraph, "There are lots of interesting people here and I have met a lot more young families, which is helping shake off the image that everyone who lives here is a banker." For more information on the culture, restaurants and nightlife of Shad Thames, see our area guide. Looking for estate agents in Southwark? Get in touch with us today.